Henry Melton is often on the road with his wife Mary Ann, a nature photographer. A jagged path has taken them to dozens of science fiction conventions and even more National Wildlife Refuges. His writing office is often a laptop perched on the Jeep’s steering wheel as she tracks down the rare and the beautiful beside some secluded dirt road. From the Redwood forests to Death Valley to the Great Lakes to Delaware swamps to the African bush, scenes out the windshield become locales for his fiction work. He is frequently captivated by the places he visits, and that has inspired his series of YA novels; Small Towns, Big Ideas. Check his website, HenryMelton.com for current location, his stories, a blog of his activities, and scheduled appearances. Many years of travel stories are archived on-line. Henry’s short fiction has been published in many magazines and anthologies, most frequently in ANALOG. Many of these shorts have found their way to his online magazine of serialized fiction, there with new stories and serialized novels. Ongoing is the Small Towns, Big Ideas series of books, where high school aged heroes of the here-and-now are confronted with classic science fiction themes. The first, Emperor Dad, a winner of the2008 Darrell Award for Best Novel, has Hutto football player James dealing with a father who has just invented teleportation. Lighter Than Air in the Upper Peninsula of Michigan has won the 2009 Eleanor Cameron Golden Duck Award for Middle Grade Science Fiction. Currently at nine titles, these books are perfect for a school library shelf, but are very popular with adult readers as well. For general audiences, he is currently three books into The Project Saga, a tale that begins today when a nearby supernova explodes (Star Time) and stretches far into a future where the Solar System is re-engineered and humanity finds its place in the galaxy. Sharing what he’s learned about the art, craft, and business of writing has been an on-going part of his life, from grade school readings to teaching formal classes and veranda coaching for the students of George Benson Christian College in Zambia during his 2007 trip to Africa. If you find him a bookstore of science fiction convention, stop and chat about your writing or his. Come Christmas every year (his birthday), you can find him with his beard grown long, sharing knowing smiles with the little children he meets, who alway seem to recognize his secret identity, even when he doesn’t wear his red suit. 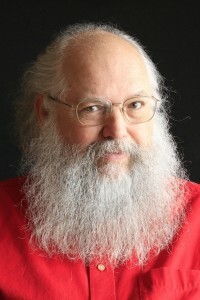 Twitter #SantaSighting for people who make that connection.